Heat oven to 375°F. Grease bottom only of 9x5-inch loaf pan with shortening or cooking spray. In large bowl, stir Bisquick mix, sugar, oats, bananas, milk and eggs until moistened; beat vigorously 30 seconds. Gently stir in blueberries. Pour into pan. Bake 45 to 60 minutes or until toothpick inserted in center comes out clean. Cool 10 minutes. Loosen loaf from sides of pan; remove from pan and place top side up on cooling rack. Cool completely, about 2 hours, before slicing. Not only are oats 100 percent whole grain and a great source of fiber, they also add a nutty flavor and texture to many baked goods. Oats also contain soluble fiber, which can help lower cholesterol. If you're using frozen (thawed) blueberries, be sure to drain them on a paper towel to soak up all the extra juice. 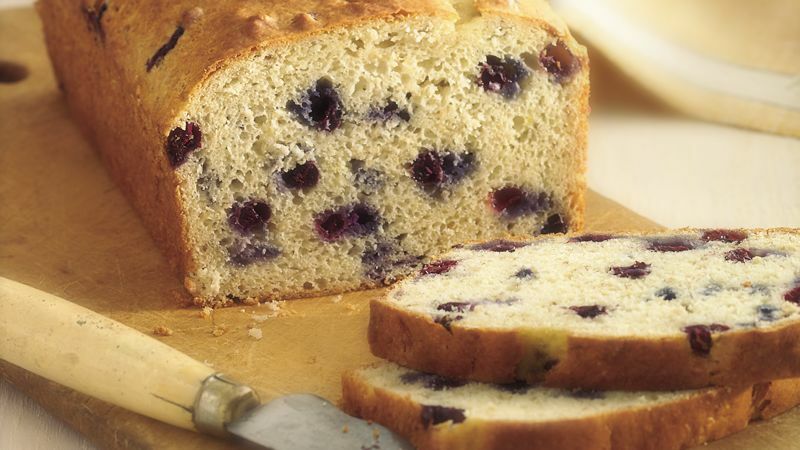 Enjoy a slice of this scrumptious bread with a hard-cooked egg for a hearty breakfast. If your meal plan allows 3 or more Carbohydrate Choices, pour a glass of juice or opt for a fresh orange.